understand the appeal-and the problems-of this gloriously wild and woolly area, where the old order has learned to survive by staying one step ahead of the new. With its impressive mix of history, heritage, sporting assets and hard-nosed farming know-how, Castle Heaton has much to intrigue a well-heeled sporting incomer. The estate, which sits either side of the River Till, a tributary of the Tweed, is being sold either as a whole, or in two lots. The main residential element, on the west bank of the Till, comprises Castle Heaton House and gardens, its adjacent Granary House and Tower, four stone cottages, an arable and grassland farm, a pheasant shoot and a very private beat of salmon and sea-trout fishing-638 acres in all-and is on offer at a guide price of ‘excess £6.15m’. 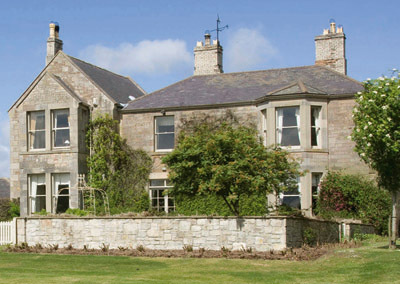 Castle Heaton House (pictured) is a substantial 19th-century stone and slate building-extensively refurbished and upgraded in 1992-with three reception rooms, a large kitchen/breakfast room, a nursery, six bedrooms and four bathrooms. The Granary House, on the west side of the gardens, was partially demolished and converted in 1998 to create an annexe to the main house, with one main reception room, a kitchen, four bedrooms and two bathrooms. It is attached to a castellated tower currently being modernised to provide a large, open-plan reception room with a high vaulted roof, an en-suite double bedroom and kitchen area. On the east side of the river, 590-acre Shellacres is a first-class farming estate in an area renowned for its arable farming, and holds the Guinness World Record for the most wheat harvested in eight hours-551.6 tons. The holding, which is being offered on its own for ‘offers over £5.35m’, includes a traditional stone five-bedroom farmhouse, seven cottages, modern and traditional farm buildings, salmon and sea-trout fishing, an excellent driven pheasant shoot, roe-deer stalking and, duck-flighting. ‘If you’re mainly interested in buying a house to show off to your friends, then Northumberland is probably not the place for you,’ advises Sam Gibson of Strutt & Parker in Morpeth (01670 516123), who is also locally born and bred. Perhaps so, but right now, he’s selling two quite charming Georgian houses that anyone would invite their very best friends to. One of England’s most beautiful salmon rivers, the Coquet, rises in the Cheviot Hills and links Northumberland’s past and present as it winds eastwards past priories and castles towards the North Sea coast. Towering above the Coquet, three miles south of Alnmouth, stand the ruins of Warkworth Castle, a stronghold of the Percy family, Earls and Dukes of Northumberland, in medieval times. Two miles upstream stands Morwick Hall, listed Grade II, a handsome Georgian house built by the Grey family of Howick. The present owners, who bought Morwick Hall in 1991 and have refurbished the interior with some style, are now downsizing, and the house is being offered by Strutt & Parker at a guide price of ‘excess £1.6m’. In classic Georgian style, the hall has free-flowing ground-floor rooms that include four main reception rooms, a music room and a 20ft kitchen/breakfast room, plus seven bedrooms, three bathrooms and cellars. To the rear of the house, a charming courtyard of carefully preserved outbuildings and a Grade II-listed stable block provide additional private space. The grounds, 12.85 acres in all, include some fine protective woodland, the park, a further paddock and splendid landscaped gardens that have been open from time to time under the National Gardens Scheme. Further upstream still, the same agents quote a guide price of £2.25m for elegant, Grade II-listed Acton Hall at Felton, seven miles from Alnwick, voted the ‘best place to live in Britain’ in a 2002 Country Life survey. According to its listing, the main block of the ashlar stone manor was built in about 1730, and incorporates a previous building from the 17th century or earlier; the house was visibly extended to the east in the early 1800s. The present owners, who bought Acton Hall some 10 years ago, have refurbished and maintained it with great care, adding an orangery leading out to the walled garden, buying in additional land to make up its 42 idyllic acres and creating two lakes and a large pond. Sheltered by a belt of mature woodland, the main house has four reception rooms, a family kitchen, a music room, a study, a billiards room, six bedrooms and two bathrooms; to the north-east of the hall is a three-bedroom stone cottage. The beautifully landscaped grounds include gardens, a tennis court and parkland with breathtaking views to the sea, and the sale includes fishing rights for two rods on the Coquet in the valley below.